When creating a narrative around your data, you are the most valuable tool you have. Being conscious of which colors you use in your map is an important way to get the reaction you intend out of your audience. Color is a powerful instrument when mapping your data because it can help create clarity about your map's underlying message. Your color choices can make the difference between confusing—or convincing—your audience. This quick guide introduces easy ways to tell captivating stories with your maps by using the color options in smart mapping. 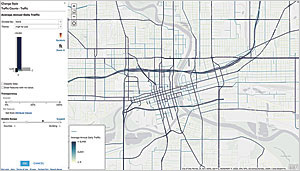 As you create your map in ArcGIS Online or Portal for ArcGIS, you have the opportunity to go beyond the smart mapping defaults to create a story centered around your knowledge of the subject and the data. But how do you know which options to use? It's as easy as 1-2-3! Only counties with above-average unemployment rates get a deep red color, which provides an easy distinction for the map reader. This step is a mental exercise. 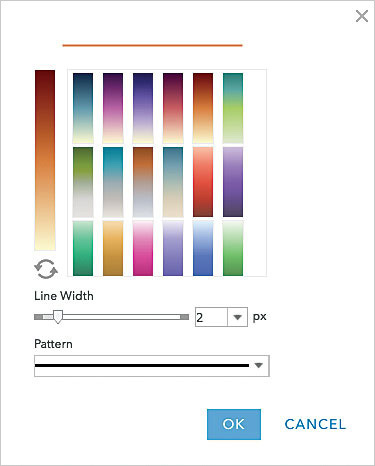 It only takes a moment but can help you later when you are making color choices. 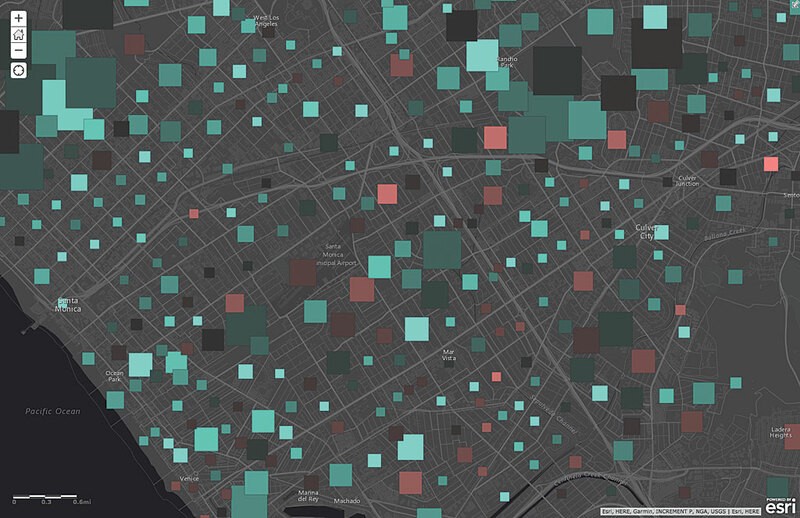 Think of your map as the interface to your data. You have been tasked to create this interface, so it is important to be as clear as possible for your audience. You want to relay an important message. 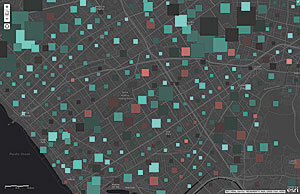 Rather than just dump data onto the map, take advantage of color to tell your narrative. Really consider why you are making your map. Are you answering a question? Are you trying to convince someone to take action? Are you telling a story? Are you trying to learn something new? No matter your purpose, make sure to take a step back as you make your color choices, and ask, what is this map telling me? When looking through the options, consider that certain colors like red might unintentionally trigger negative or strong emotions. Color can make people feel differently about your topic, so consider what you want your audience to feel when they look at the map. Since smart mapping will choose a color ramp that will harmonize with the basemap, choose the basemap first. Smart mapping will offer color ramps suitable for each basemap, so it is a good practice to choose your basemap first. It helps create context for your map, and it takes only seconds. You can choose from the Basemap Selector or the Living Atlas or use your own custom basemap. 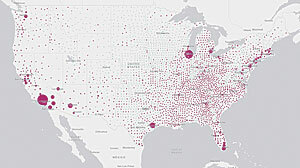 You can also apply transparency to your basemap and its reference labels to draw more attention to your data. Change the roads color from the default blue to brown. Smart mapping will automatically provide you with a map that uses a High to Low theme. This is a great way to emphasize the highest and lowest values in your data using a gradient of colors or two distinct colors (one for the highest and one for the lowest). 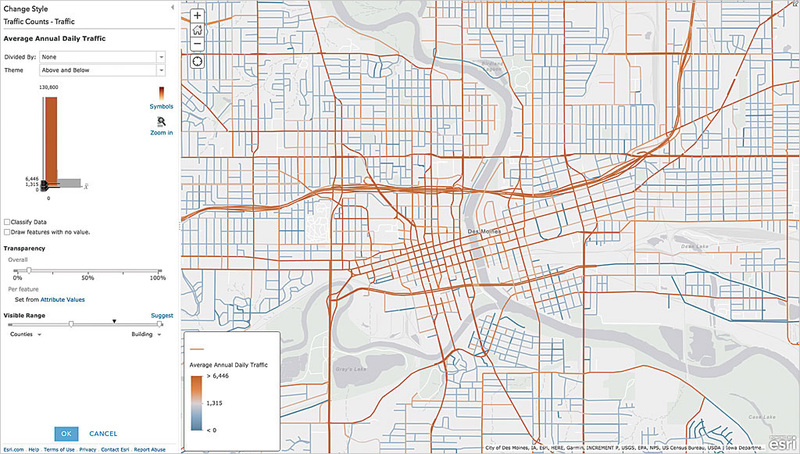 For example, if you were mapping annual average daily traffic on roads in the city of Des Moines, Iowa, the default High to Low theme would show roads with the most traffic using the darkest color in the ramp. Remember the first tip? Let's put it into action and plan the map. We can select one of the many color ramp options to change the roads from the default blue to a brown. Another way to change the story being told by the data is to change the theme option to Above and Below. This focuses map symbology around a central value using color to show which features have values above or below the specified value. 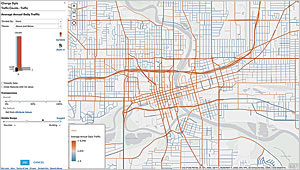 By default, smart mapping uses the statistical average of your data, but you can also adjust the center value to one you know is more meaningful for the map's subject. 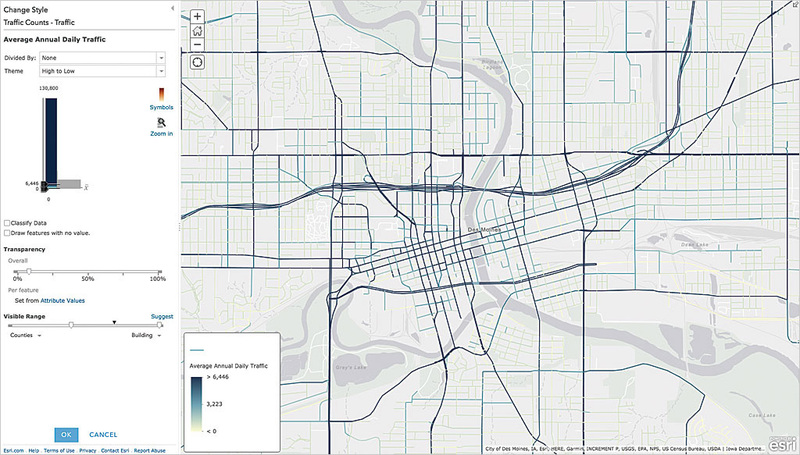 Using the city of Des Moines example, to show which roads have above-average daily traffic, you could use the Above and Below theme to easily highlight this information. When using this technique, smart mapping provides color ramps that diverge into two different colors. The value you choose as the center value for your map will be the point at which the colors split, so you can easily see that the brown streets have daily traffic levels that are above average, while blue streets are below average. Small adjustments can make a world of difference in your maps. While smart mapping can create a valuable default map for you, these basic tips can help you create more informative narratives using your knowledge of the data. If you were mapping the annual average daily traffic, the default High to Low theme highlights would show roads with the most traffic by using the darkest color in the ramp. Use the Above and Below theme to show which roads have above-average daily traffic.